2. The pension fund affects over 170 employers in Derbyshire including Derbyshire County Council, all the borough and District Councils in Derbyshire [b]; Derby City Council; Chesterfield College; Derby College; Derbyshire Fire Authority; Derbyshire Police Authority; Peak District National Park Authority; University of Derby and a large group of smaller employers. 3. 97% of climate scientists agree that humans are the primary cause of recent climate change, largely due to the release of greenhouse gases from the combustion of oil, coal and gas for heat and power. 4. In order to stop the global climate warming by 2 °C above pre-industrial levels and avert global catastrophe, 80% of all known fossil fuels must stay in the ground. 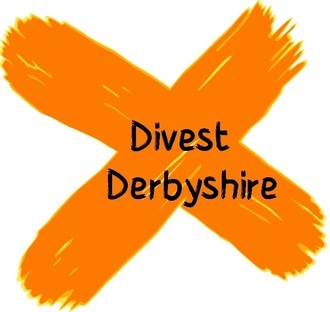 [e] By removing investments in fossil fuel companies Derbyshire County Council will be showing its commitment to creating a healthy, sustainable future for both the people of Derbyshire and the planet as a whole. 6. Institutions across the world including churches and universities, the Environment Agency [ i] as well as local authorities in the UK such as Bristol City Council and Oxford City Council have already committed to divest from fossil fuels. [ j] Let’s see Derbyshire join them in making this small but impactful commitment. 7. The above question is forms part of the Derbyshire wide petition, which can be downloaded from http://www.transitionchesterfield.org/divest-derbyshire/ This petition is supported by the following Derbyshire organisations (in alphabetical order): Calow Against Gas Extraction (CAGE); Derby Climate Coalition; Glossopdale Transition Initiative; Melbourne Area Transition; Sustainable Edale; Sustainable Hayfield; Transition Belper; Transition Chesterfield, Transition Hope Valley, Transition New Mills. Transition Wirksworth; University of Derby Students’ Union. Previous PostChair of Independent Committee on Climate Change speaks in DerbyNext PostParis and what next?